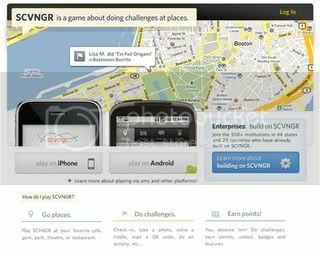 SCVNGR, the Google-backed mobile game start-up that allows users to earn points and prizes by completing challenges, continues to rack up the partnerships, today announcing the formal launch of its Cities product, in conjunction with the city of Chicago. What makes SCVNGR interesting from a sponsorship perspective? Much like individuals do, events, cities and small businesses can build on SCVNGR by adding their own custom challenges and rewards at their locations, or the locations of their partners. Using their existing fanbase, event properties, and muncipalities, can use this as a new benefit in sponsorship packages, as a new way of driving traffic to the retail locations of key partners. "Say you're a city ("I'm a city") and you want to take all of the AMAZING STUFF your city offers -- all of those historical tours, festivals, conventions, restaurant weeks, parades, heritage celebrations, commemorative days, hometown pride memorials, shopping districts, hot spots and themes -- and put it up on the location-based social graph so people can use their little mobile devices to engage, play and unlock rewards in a 21st Century way. Oh, and share with the 500+ million people on Facebook and 200 million people on Twitter to get the word out about your city. Well, dontcha? Today it's possible. And it's possible with SCVNGR. Because today is the launch of Cities on SCVNGR, and it's coming to Chicago first. The SCNGR team used Philadelphia's Convention and Visitors Bureau and Boston's Freedom Trail Foundation as their guinea pig for the new city-specific challenges product. Similar programs were then rolled out with host cities, like Grand Rapids' world-renowned ArtPrize and San Francisco's recent Hardly Strictly Bluegrass Festival. "We are excited to expand our social media platforms and partner with SCVNGR to challenge people to take photos, answer trivia, and complete fun tasks while exploring the City's diverse neighborhoods," said Dorothy Coyle, Director of the Chicago Office of Tourism. "This is yet another innovative and interactive opportunity for us to educate residents and visitors alike about Chicago's cultural offerings." SCVNGR is currently being integrated into conference content to engage attendees in relevant and fun ways, most recently with IMTS 2010, the city's largest conference with 90,000+ attendees. "Business visitors coming to McCormick Place are on mobile phones already, checking email and sharing via social media. This is a natural extension of the show experience for exhibitors and attendees alike," said Harvey Morris, CCTB's Director, Digital Marketing & Social Media. "And SCVNGR's flexibility in building out custom challenges allows the show organizer to help shape the attendee experience in a way that's fun and engaging." The move, which is great news for event properties and municipalities, puts SCVNGR squarely in the sights of other location-based networks like Foursquare and GoWalla. While Foursquare and GoWalla have a heavy focus on businesses and brands, so far, it seems SCVNGR is placing a lot of attention on building the most event friendly platform of the three. Check out how the New England Patriots used SCVNGR to power a recent fan promotion in the video below.